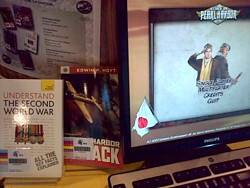 Learned about something called the "Augmented Reality App for Shelf Reading" (hat-tip to Artem Russakovskii of AndroidPolice.com). It's a prototype app developed by the Miami University Augmented Reality Research Group, or MU ARRG for short. 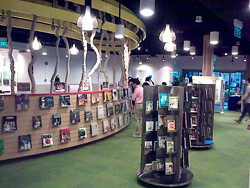 The device's built-in camera reads and detects the item spine labels. Items that are not in sequence are identified on screen. By zooming in the camera to the "misplaced" item, the app displays the direction to shelve the item (left or right arrows) and is also able to identify the specific right spot. 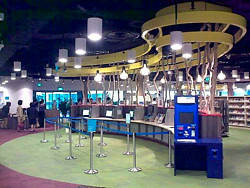 In addition, the system is able to generate a list of books that have been "scanned". It's only a prototype and not a finished product, but it's easy to see how the system can be refined into a more robust system. For instance, making it hands-free (maybe a flip-cam worn as part of a headgear, or shoulder-mounted, or mounted on a trolley and raised to eye level). What's impressive is that the app runs on a mobile device rather than a laptop. Which means it's space-saving. Probably more energy-efficient as well, being able to run for longer time on a single charge. I'm also reminded of this post that I wrote back in Jul 2006, where I mentioned about "wearable devices" and visual identification of library items. p.s. 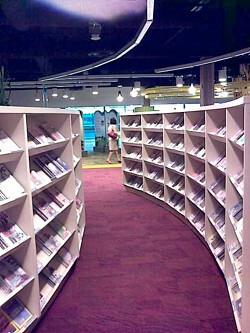 I can imagine a skeptic asking "What if printed books no longer exist?" 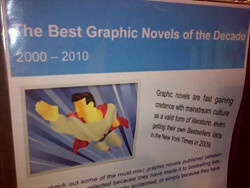 -- well, that's besides the point and I believe books will still be around for at least another decade. Unless mobile devices become cheaper than a book. The availability of high-bandwidth information over the Internet (i.e. audio and video) has surely increased people's understanding and empathy. Especially for those not directed affected by the crisis. Ever wonder what the fourth-largest recorded earthquake since 1900 sounds like? The Laboratory of Applied Bioacoustics (LAB) has posted the eerie sound online. 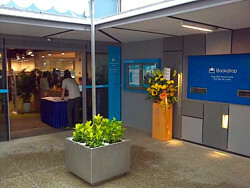 The Japan Agency for Marine-Earth Science and Technology (JAMSTEC), a network of underground observatories more than a thousand meters below sea level, made the chilling recording as the quake struck. 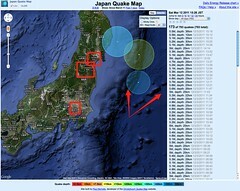 This website, Japan Quake Map, is brilliant. It's developed by Paul Nicholls, who developed the Christchurch Quake Map. The map shows a time-lapse visualisation of the Sendai earthquake and its aftershocks. It plots earthquake data from the U.S. Geological Survey using the Google Maps API. The size of the circle reflects the magnitude and the colour shows the "focal depth". 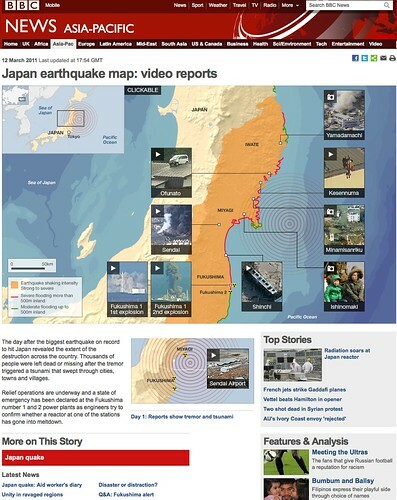 It's About Page explains that the site was built "primarily to help those outside the affected area understand what the people of Japan are experiencing." Following a few major news and related-agency websites, I found their reports up to date but they lacked the comprehensiveness I was looking for. Like, what were the place names, where and when did the quake first happened. One report might talk about the power and food shortages in Tokyo. Another would cover the nuclear reactor crisis. A separate one would talk about the tsunami aftermath. I think the terms "earthquake", "tsunami" and "nuclear reactors" became closely associated with "Japan". But I suspect not many people could link those separate events with the place names (it would be interesting to find out). The Fukushima prefecture probably became a familiar sounding name to most people, because of the ongoing updates and reports of the reactor crisis. My guess is that not many people would know Sendai was the place most affected by the tsunami (they might know about the tusnami). Tokyo was mentioned in the subsequent days, though I'm not sure if people realised it suffered aftershocks and disrupted food supplies rather than the immediate threat of (the potential) nuclear fallout. Information was scattered in that sense, with individual authoritative sites focusing on specific information. 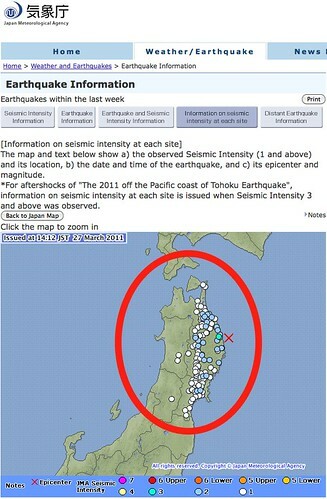 Like the Japan Meteorology Agency quake information page, with a map can be expanded to show the epicentre and the seismic intensity in surrounding areas. But you wouldn't get a chronological sequence of events. I think they updated the page over several days, if I wasn't mistaken. There's a list of place names down the page (didn't recall seeing that when I first visited the site). The Google Crisis Response page was a convenient directory, though it wasn't quite the place to find all the information I was interested at that point. The BBC News site is still one of my favourite news agency. Though in this case, it didn't quite provide what I had in mind. For instance, there are video footage linked to the place names. But clicking on the video for "Sendai", the caption only says "Sendai was hard hit. Aerial footage shows an industrial complex on fire, submerged houses and stranded ships". Nothing about the tusnami and flooding. I wanted to find an English language page that summed up the chain of events, and the places affected. Eventually, I looked at the Wikipedia entry. 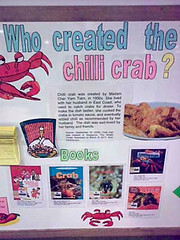 It was by far the most comprehensive in terms of the information I'm looking for. I even showed it to my Japanese friend, who currently resides in Singapore. Even she was impressed with the coverage, at a relatively short time. BTW, my advise is still to make some attempt to verify information (or as my MSc professor would say, "Triangulation"). For me, by mentally referring to information from BBC and other news sources, I could use the Wikipedia information with greater confidence. Next: Part 2 - "Friends and personal perspectives"
"Can't find the game? Want to try the book?" 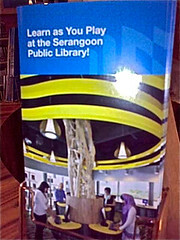 Was helping out at today's official opening of Serangoon Public Library. A young boy approached me. He must have been about 12. "Are you here to help people look for things?" he asked in a meek way. 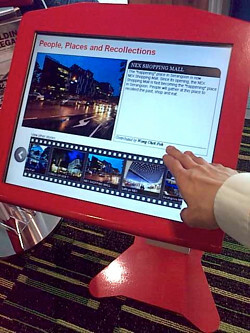 He was interested in an item from the Visual Discovery kiosk. Said he tried to look for it on the shelf but it wasn't available. We checked the kiosk display again. Seemed like a rather heavy-going book for a 12 year-old. 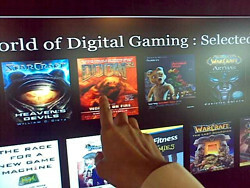 He pointed to the word "Game" in the display. Which made me ask him if he was interested in the book or the computer game. "I want to play the game." "Oh, this title is a book. Not the actual computer game". Apparently, he was looking at the Subject field which contained the word "Game". "Why not try reading the book?" OK, that wasn't so subtle. But I had to try. He gave a sheepish smile. The way kids do when they mean "I'd rather not" but don't want to say anything for fear of offending an adult. A few minutes later, he came looking for me. "Where can I find Greg Bear?" I brought him over to the Fiction section. Greg Bear was definitely not a Children's author. This kid's reading upwards (not my place to doubt him either). "Halo" must be one heck of a game for him (Thank You, Bungie). "What's the title?" I asked. 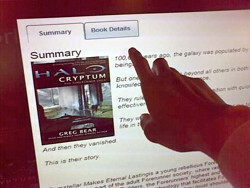 "Halo Cryptum". He had to spell out "Cryptum", as he couldn't quite pronounce it. Unfortunately for him, the title wasn't on shelf. "Did the OPAC say the item was available or out on loan?" He started looking doubtful. 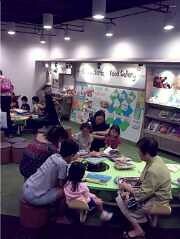 We scooted to the nearest OPAC. A man was using it, so we waiting in line. The boy appeared eager for the man to finish this search, for he stepped up pretty close to the guy. But he was discreet enough to stand just a little behind. He typed in "Halo". We went through a few minutes of clicking on titles and checking the availability. I showed him how to limit the search to only SRPL. We clicked through a few titles. Some that he picked out weren't novelisations. I explained that to him. It seemed like we were performing a cat-and-mouse game, hunting down available titles. There was a queue behind us. I asked they boy if he wanted us to email him a list. "I don't have email at home". My colleague, Jan, happened to walk past. She took stock of the situation and immediately offered to help print out a list. 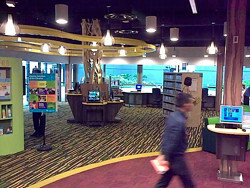 Asked him if he could wait for 5 to 10 minutes while she went to the office to get it done (this wasn't something we readily offered on the spot, as SRPL wasn't a regional library with an advisory counter). Meantime, I thought I'd try looking around for Halo novels. Something about the kid made me want to ensure he didn't go back empty handed. 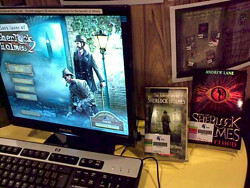 By chance, I noticed "Halo: The Cole Protocol" sitting on a display panel. I picked that up. Found the boy sitting on a floor reading. I triumphantly presented the book to him. "I already have this," and he showed me. Nice! But I thought I'd try one more time. I'm sure there were some other titles he wasn't aware of. I don't know what you can call it. Perhaps it was from a selfish professional reason. Professional pride? 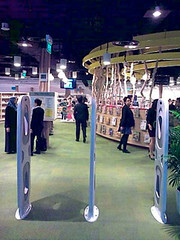 All the OPAC stations were occupied. I wasn't sure how long the boy would be staying in the library. Gotta rely on memory. Walked over to the Fiction shelf. Looked under "N" and then "Ny". It was "Eric Nylund". Two of his stories were in plain sight: "The Fall of Reach" and "Ghosts of Onyx". I brought both titles to the boy. The delight in his "Thank You" was simply priceless. 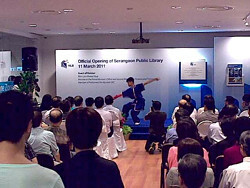 Like many of my Public Libraries colleagues, I was helping out at today's official opening of Serangoon Public Library (SRPL). ASIDE: In case you're not aware, SRPL has a Facebook page. 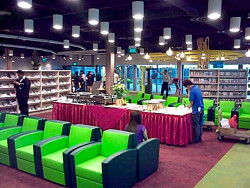 Seeing the library fill up, with customers of all ages, gladly reminded me of the voracious reading appetite of some Singaporeans and members. You'll see that in a few pictures. 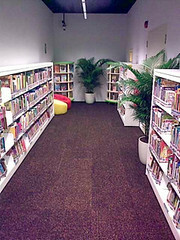 The library was quietly ready for business. 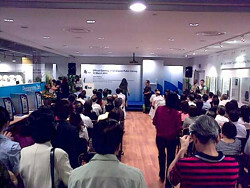 Staff were on hand to receive invited guests. 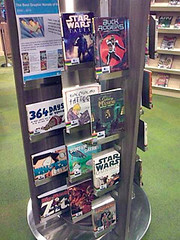 Very nice range of graphic novel titles. I was really tempted to borrow some for myself. But nah, we'd like to let the public have a go at them first. 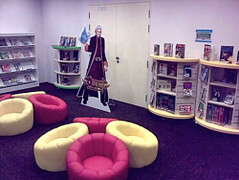 "The first public library in Singapore to have a dedicated area for gaming, SRPL aims to promote learning and a reading culture by tapping on the educational effects of games. 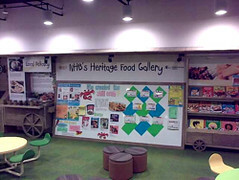 The games featured in this area will demonstrate significant educational content or learning value." 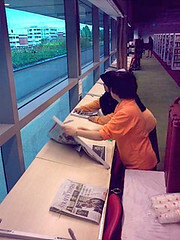 Source: NLB Press Release. See also Channelnewsasia. 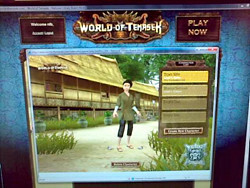 The games that are currently featured include "The World Of Temasek", which is a pretty cool virtual 14th Century Singapore and role-playing game environment, developed by Magma Studios in partnership with National Heritage Board. 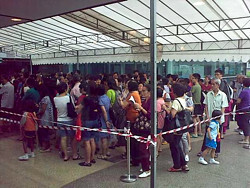 An orderly queue had already formed before the library opening time. 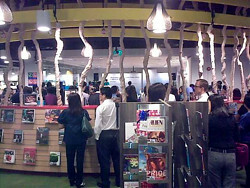 The library staff shouted out a countdown to the last seconds, before the doors opened to the general public for the very first time. 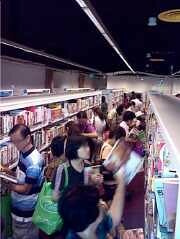 I'm sure many of these were neighbourhood residents, who have been eagerly waiting for a library near their homes. 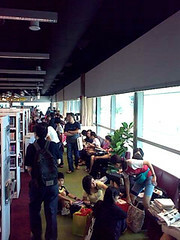 Library staff and volunteers were on hand to assist customers. 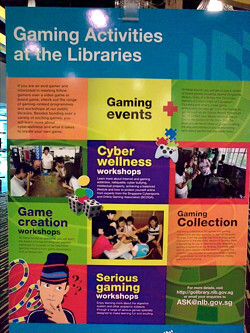 The Gaming Area was a hit with the kids, naturally. This picture is easily my favorite: it says "family", "intergeneration", "the young learning with the old"... sweet! 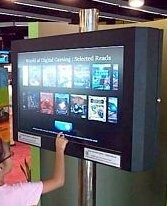 This is a new service being prototyped at SRPL, something called the "Visual Discovery Kiosk". 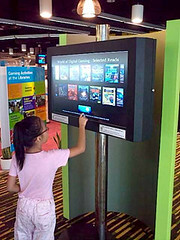 A touch-screen digital book display, if you will. 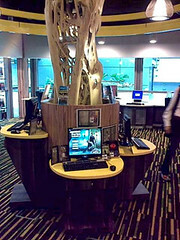 The items displayed complements the Gaming Zone. 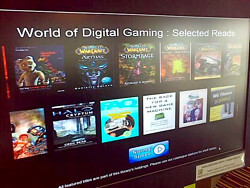 The kiosk displays "games" related books -- includes Fiction, and Non-Fictional works like game play design and creation -- that belong to SRPL. 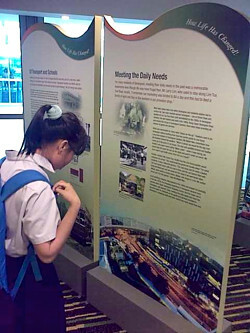 This neat little touchscreen display features the winning entries of a “People, Places & Recollections” photo contest. 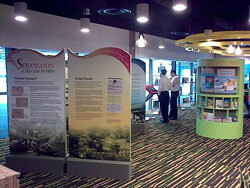 The event was organised before the library's official opening, where the community was invited to share photographs on the Serangoon area. One middle-aged lady approached me and asked, "May I give you some feedback?" "I just love the library. It's the best use of the taxes I pay." Next: "Can't find the game? Want to try the book?"